Louisville Crowds on Derby Day? Problem, Solved–Here on Union Ave., in Saratoga. In just 12 brief days, ‘t’will be the First Saturday in May. 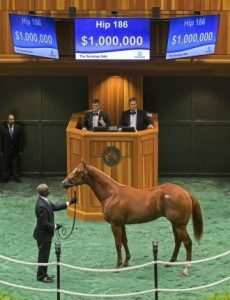 If you’re a horse racing fan, you know that this means that’s the day when 20 American Thoroughbreds will stuff into their designated stalls at Louisville’s gigantic Churchill Downs, and begin the Run for the Roses–the Kentucky Derby. If you’re into Big Fun and Big Crowds–Louisville is definitely where you want to be on May 5th. 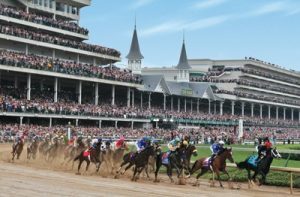 If you’re NOT into Big Crowds, but still want Big Fun–and to cheer on your favorite Kentucky Derby horse–you can go to the luscious Kentucky Derby bash at the National Museum of Racing and Hall of Fame, just four doors down from our serene little inn. You will not encounter 149,999 other horse racing fans at the Museum’s Derby Day party–thank God, right? But you will have a rockin’ good time with your friends and new friends–whom you’ll meet over cocktails and mocktails in THE only Thoroughbred racing Hall of Fame. For information about the event, click the URL, below, or call (518) 584-0400, ext. 109. OK, so we’ve got you all set with the place to watch and play on Derby Day. Check. Now, we need to establish your accommodations for the night after the party. The soiree ends at 7PM, at which time you may wish to venture forth into downtown Saratoga Springs–a brief walk down Union. OR you may opt to wander simply five doors from the Museum, and dine with our friends at the Brook. But however you do it–your ONLY sure bet that day–is that you should stay here, with us, at the end of your winning Kentucky Derby Day. 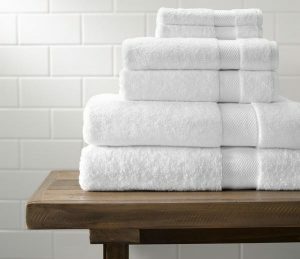 Whether you check in the night before, Friday, the 4th–sleep in on the 5th before the party–then sleep again on the 6th, OR you reserve only for the night after the Derby–believe us, you will need a place to rest your head that’s within walking distance of both the Museum and downtown. Even if that’s only because you danced your face off for three hours before the race, then waddled downtown, wearing stilettos–you’re gonna need a comfy, welcoming bed to crash. And a gourmet breakfast the next morning. 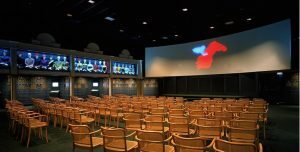 Whether you’re a local, or coming in for the party, and don’t want to deal with 150,000 strangers–come, party at the National Museum of Racing and Hall of Fame. And spend Derby Day-Night, and maybe the night before–with us. 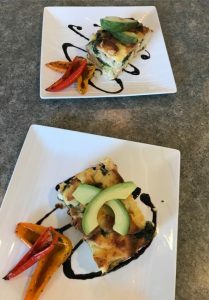 This mini-vacation will do your soul good–and get you all wired and ready for the upcoming Saratoga race meet. Call now to res your room: (518) 584-6751. 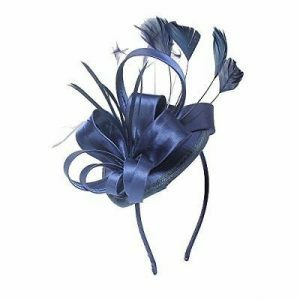 We’ll set you up, so that all you have to worry about on Derby Day is, which hat or bowtie to wear. 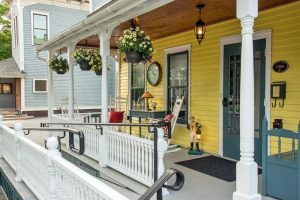 Posted in Brunswick Bed and Breakfast | Comments Off on Louisville Crowds on Derby Day? Problem, Solved–Here on Union Ave., in Saratoga. Too many uninformed folks think that the only time Saratoga is alive is during the frenetic, wild, broiling days of July and August when the Thoroughbreds race across Union Avenue from The Brunswick at Saratoga Bed & Breakfast. Oh, pish. This rumor flies directly in the face of Reality: Saratoga is a year-round destination. Right now, April, is a fine example: event listings are pouring in. So many options: it’s possible to become dizzy just from reading about all the opportunities for fun, learning, adventure and the making of new friends. 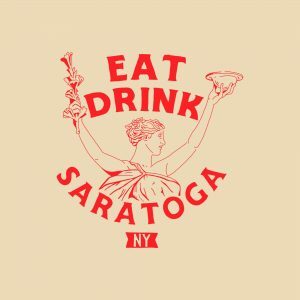 If there’s one thing Saratoga loves, it’s an opportunity to eat and consume beverages. When it’s for a good cause–even better. So many things in-between those two dates–and many will come happen after June 30. 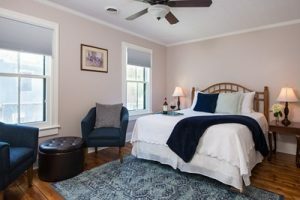 But the one thing that you know you’ll need in order to enjoy Saratoga to the max–whether it’s a concert, food/bev event or historic re-enactment is: a comfortable, soothing place to lay your weary head at the end of your hectic days and nights. And, being in walking distance of downtown Saratoga, and mere steps from the Saratoga Race Course and Fasig-Tipton–really, booking now with us at The Brunswick at Saratoga Bed & Breakfast–is the only sure bet in this town. It’s 5 0’Clock Somewhere Spring Break Patio Party! Like the Cavalry before them, West Point Rides in–and Rights a Wrong. Where would horse racing be, were it not for the magnificent steeds, and their people of truly good heart who make it happen, day-in and day-out? Those for whom the words, “community” and “decency” mean something? Chief among those people who hold decency and community close to their hearts–values that everyone should embrace, of course–tonight, we at The Brunswick at Saratoga must point our gratitude in the direction of Terry Finley and Tom Bellhouse of West Point Thoroughbreds. You see, Monday, April 16th was the first day for workouts at the Oklahoma Training Track here at Saratoga Race Course for 2018. Almost as anticipated as Opening Day at the race course across Union Avenue in July–the Oklahoma’s endearing scent of Sweet Timothy brings the nickering of Thoroughbreds and their ponies from far-and-wide. It also brings race fans, media and curiosity-seekers. This year, it brought rain and grey, as well–but that didn’t dissuade those of us for whom this annual ritual of New Beginnings brings joy. The horses at Oklahoma are the real harbingers of Spring. When we bought this place from its previous owners, we inherited the fascinating history, location, reputation–and a lawn jockey. 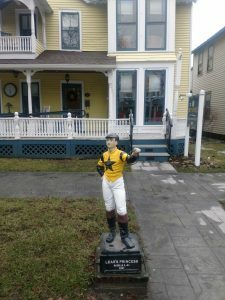 A B&B on Union Avenue without a lawn jockey would be, why, a sad thing. So we gratefully took the miniature man as part of our business agreement, and made him our own. He set up his home cozily on our lovely front porch, and greeted both guests to our establishment, but also citizens and tourists who passed by. Until. Until one day when our beloved lawn jockey was stolen–and destroyed. We won’t spend one more minute thinking about who did it, or why. That’s negative. Instead, we’ll tell you about the karmically good thing that happened. Our Tom was in the Brook one day, and ran into the beloved Tom Bellhouse, COO of West Point Thoroughbreds. The topic of our trashed lawn jockey came up, and Tom thought that was a travesty. Tom would not–could not–be an associate of Terry Finley, West Point Thoroughbreds’ President and CEO–were Tom not cut from the same noble fabric as Terry, himself. One thing led to another, and before we knew it–Terry and Tom made sure that, not only did we have A Lawn Jockey–we became the proud owners of a West Point Thoroughbreds lawn jockey! He (our jockey) spent his winter in Tom’s office, but yesterday he was taken out, spit-shined and buffed–and put outside again. Ready to stand guard for another half-year. Sure, it was raining, and grey. But it was Opening Day at the Oklahoma–and the horses deserved our very best salute. A West Point salute, at that. Posted in Brunswick Bed and Breakfast | Comments Off on Like the Cavalry before them, West Point Rides in–and Rights a Wrong. Posted in Brunswick Bed and Breakfast | Comments Off on The Brunswick at Saratoga Bed & Breakfast Presents: Christmas in July. And August. 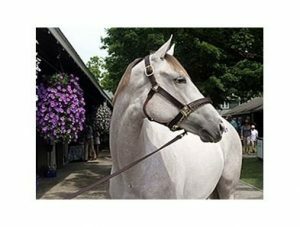 Posted in Brunswick Bed and Breakfast | Comments Off on Saratoga Yearling Sales 2018…One Night, Two or Three…Reserve Now, Race Fans. Posted in Brunswick Bed and Breakfast | Comments Off on Countdown to the Triple Crown: Our Bed. Our Breakfast. Tom. You. Racing Hall of Fame…Magic.